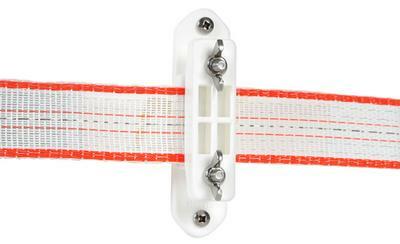 Specially designed to firmly secure 40mm (1½") Poly Tape (G6240) and Turbo™ Tape (G62454) on corners. Unique rubber pads prevent tape movement and eliminate tape wear. Insulator body made from high density, impact resistant polyethylene for strength and long life. High visibility white, specially designed for safer horse control. Screws provided for easy installation.